This afternoon I finished vacating the room where I have had my office and LEGO room for the past few years. We’re going to turn it into a guest room so I am moving to one of the bedrooms. This move is a compelling event for getting ready for the big purge. 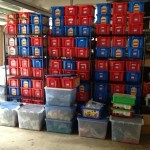 Right now I have my own version of Pick-a-Brick in my garage! 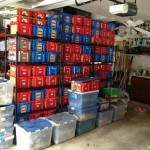 There is just under 100 LEGO tubs on these shelves. This entry was posted in Sorting, Storage and tagged For Sale, Sorting. Bookmark the permalink.